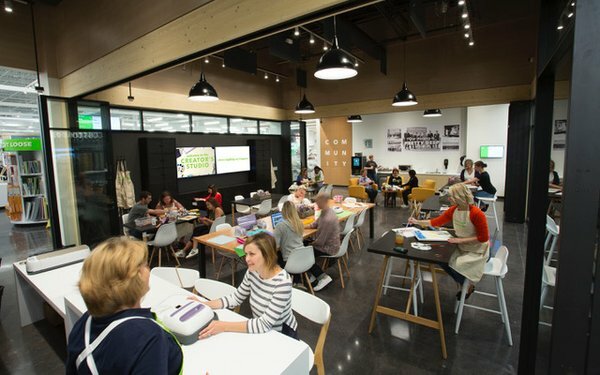 Joann Fabric hopes to become a social hub for the crafty set, launching a new retail format that blends tech, community and classes into a different kind of store. The Creators’ Studio, which includes a Starbucks kiosk, is central to the plan, and the Sephora-meets-Etsy vibe is intentional. A touchscreen kiosk provides popular Pinterest craft projects, personalized based on their taste preferences. While there isn’t food for sale, “people are pretty likely to be able to snag a cookie from the test kitchen,” he says. New services include personal shoppers and Sew & Go, which allows customers to hand off projects to seamstresses. “We do the work, and you take the credit,” he says. And it’s also added Joann +, targeting high-volume makers, much as stores like the Home Depot cater to professionals. Installations around the store feature work from local artists, some of it for sale. A third group is especially eager to learn and hungry for classes.